Over the last week and a half, several different events have been held at and around the lighthouse. In my last post, I mentioned that Celebration Days was starting the next day. The following weekend, the Heritage Coast Grand Prix (boat race) was held in town and there was a wedding at the lighthouse. These events brought more people out to the lighthouse and allowed me to do some different jobs. Celebration days brought vendors, craftspeople, and reenactors to the lighthouse where they set up camp and stayed for the weekend. In order to prepare for this event, I helped to get one of the large tents ready and pass out information to the vendors. During the festival, I helped in the lighthouse and the store as normal, however I did end up making announcements of upcoming events over the loudspeakers. I really enjoyed making the announcements because it reminded me of the pre-show announcements I have made as a stage manager. I also served as an adult for two children who were too young to go into the lighthouse by themselves. They were very interested in everything in the lighthouse and their curiosity was very refreshing. 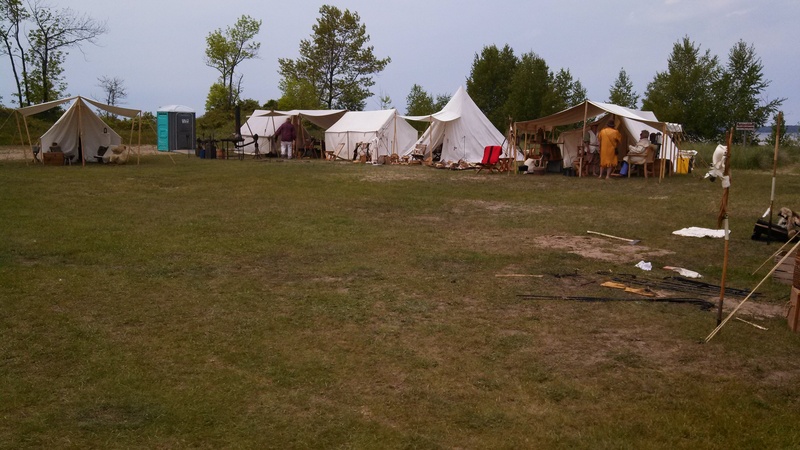 During Celebration Days reenactors camped at the lighthouse. After Celebration Days, attendance at the lighthouse slowed down for a couple of days, but because of the wedding on Saturday, we had to make sure that the grounds looked good after all of the vendors left. I helped with yard work by replanting flowers that the animals tore out and raking up around the lighthouse. One thing that I had not thought of before was the floodlights that shine up on the lighthouse. These floodlights were overgrown with grass and since an edger is too large to get around them, the grass needs to be cut with a box cutter and pulled up by hand, so that the light isn’t obscured. I was happy to help with this job because it got me outside on a beautiful, sunny day. It is very interesting to see all of the little jobs that go into maintaining the lighthouse. In addition to the wedding on Saturday, this last weekend also marked the opening of the East Tawas State Harbor Gift Shop. This gift shop is run through the lighthouse gift shop, but is located at East Tawas State Harbor dock in town. So, over the past couple of weeks we have been preparing merchandise for the harbor store because everything needed to be ready for that opening. I’m told that the opening of the harbor store and the wedding went well, but I was not there for either event because I had the weekend off to go home for my sister’s graduation party.